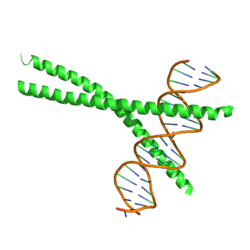 CCAAT/enhancer-binding protein alpha is a protein that in humans is encoded by the CEBPA gene. CCAAT/enhancer-binding protein alpha is a transcription factor involved in the differentiation of certain Blood cells. There are two major categories which CEBPA mutations can be categorized into. One category of mutations prevent CCAAT/enhancer-binding protein alpha DNA binding by altering its COOH-terminal basic leucine zipper domain. The other category of mutations disrupt the translation of the CCAAT/enhancer-binding protein alpha NH2 terminus. CEBPA mutations, which result in diminished CCATT/enhancer-binding protein alpha activity, contribute to the transformation of myeloid antecedents. CEBPA has been shown to interact with Cyclin-dependent kinase 2 and Cyclin-dependent kinase 4. It has been shown that mutation of CEBPA has been linked to good outcome in both adult and pediatric acute myeloid leukemia patients. Acute myeloid leukemia is characterized by genetic abnormalities in hematopoietic progenitors. This includes excessive proliferation of blasts, and blocking the hematopoiesis of ganulocytes. It has been shown that suppression of CEBPA expression and blocking of CCAAT/enhancer-binding protein alpha stops the differentiation of myeloid progenitors. For this reason, CCAAT/enhancer-binding protein alpha's role during granulocyte differentiation and CEBPA's role as a tumor suppressor gene is critically important in the prognosis of acute myeloid leukemia. CCAAT/enhancer-binding protein alpha, the transcription factor that is encoded by CEBPA, is very important in the differentiation of immature granulocytes. Mutation of the CEBPA gene has been shown to play a crucial role in leukemogenesis and prognosis in acute myeloid leukemia patients. In recent studies CEBPA mutations were found in between 7% and 15% of patients with acute myeloid leukemia. The three different types of mutations seen in these AML patients include germ-line N-terminal mutation, N-terminal frameshift mutation, and C-terminal mutation. These mutations are most frequently found in acute myeloid leukemia M1 or acute myeloid leukemia M2. Many reports link CEBPA mutations with a favorable outcome in acute myeloid leukemia. This is because these mutations are liley to induce differentiation arrest in these patients. Patients with CEBPA mutations have longer remission duration and survival time than those without the mutations. Therefore the presence of CEBPA mutations are directly associated with a more favorable course for the progression of the disease. Recently it has been shown that epigenetic modification of the distal promoter region of CEBPA has resulted in downregulation of CEBPA expression in pancreatic cancer cells, lung cancer, and head and neck squamous cell carcinoma. A recent study has found that higher levels of CEBPA methylation are directly proportionate with treatment response. The complete response rate increased proportionately with the level of CEBPA methylation. For this reason it has been proposed that methylation of CEBPA could be a very useful biomarker in acute myeloid leukemia prognosis. ↑ Szpirer C, Riviere M, Cortese R, Nakamura T, Islam MQ, Levan G, Szpirer J (July 1992). "Chromosomal localization in man and rat of the genes encoding the liver-enriched transcription factors C/EBP, DBP, and HNF1/LFB-1 (CEBP, DBP, and transcription factor 1, TCF1, respectively) and of the hepatocyte growth factor/scatter factor gene (HGF)". Genomics. 13 (2): 293–300. doi:10.1016/0888-7543(92)90245-N. PMID 1535333. ↑ Cao Z, Umek RM, McKnight SL (October 1991). "Regulated expression of three C/EBP isoforms during adipose conversion of 3T3-L1 cells". Genes Dev. 5 (9): 1538–52. doi:10.1101/gad.5.9.1538. PMID 1840554. ↑ "CEBPA". Genetics Home Reference. April 20, 2016. Retrieved April 25, 2016. ↑ "Entrez Gene: CEBPA CCAAT/enhancer binding protein (C/EBP), alpha". 1 2 Lin LI, Chen CY, Lin DT, Tsay W, Tang JL, Yeh YC, et al. Characterization of CEBPA mutations in acute myeloid leukemia: most patients with CEBPA mutations have biallelic mutations and show a distinct immunophenotype of the leukemic cells. Clin Cancer Res 2005;11:1372–9. 1 2 Wang H, Iakova P, Wilde M, Welm A, Goode T, Roesler WJ, Timchenko NA (October 2001). "C/EBPalpha arrests cell proliferation through direct inhibition of Cdk2 and Cdk4". Mol. Cell. 8 (4): 817–28. doi:10.1016/S1097-2765(01)00366-5. PMID 11684017. ↑ Ho PA, Alonzo TA, Gerbing RB, Pollard J, Stirewalt DL, Hurwitz C, Heerema NA, Hirsch B, Raimondi SC, Lange B, Franklin JL, Radich JP, Meshinchi S (June 2009). "Prevalence and prognostic implications of CEBPA mutations in pediatric acute myeloid leukemia (AML): a report from the Children's Oncology Group". Blood. 113 (26): 6558–66. doi:10.1182/blood-2008-10-184747. PMC 2943755 . PMID 19304957. ↑ Lin TC, Hou HA, Chou WC, Ou DL, Yu SL, Tien HF et al. (2011). CEBPA methylation as a prognostic biomarker in patients with de novo acute myeloid leukemia. Leukemia25: 32–40. ↑ El-Sharnouby JA, Ahmed LM, Taha AM, Kamal O. Prognostic significance of CEBPA mutations and BAALC expression in acute myeloid leukemia Egyptian patients with normal karyotype. Egypt J Immunol. 2010;15:131–143. ↑ Tada Y, Brena RM, Hackanson B, Morrison C, Otterson GA, Plass C. Epigenetic modulation of tumor suppressor CCAAT/enhancer binding protein alpha activity in lung cancer. J Natl Cancer Inst 2006; 98: 396–406. ↑ Bennett KL, Hackanson B, Smith LT, Morrison CD, Lang JC, Schuller DE et al. Tumor suppressor activity of CCAAT/enhancer binding protein alpha is epigenetically down-regulated in head and neck squamous cell carcinoma. Cancer Res 2007; 67: 4657–4664. ↑ Lin TC, Hou HA, Chou WC, Ou DL, Yu SL, Tien HF et al. (2011). CEBPA methylation as a prognostic biomarker in patients with de novo acute myeloid leukemia. Leukemia 25: 32–40. Sladek FM, Darnell JE (1992). "Mechanisms of liver-specific gene expression.". Curr. Opin. Genet. Dev. 2 (2): 256–9. doi:10.1016/S0959-437X(05)80282-5. PMID 1638120. Marcucci G, Mrózek K, Bloomfield CD (2005). "Molecular heterogeneity and prognostic biomarkers in adults with acute myeloid leukemia and normal cytogenetics.". Curr. Opin. Hematol. 12 (1): 68–75. doi:10.1097/01.moh.0000149608.29685.d1. PMID 15604894. Leroy H, Roumier C, Huyghe P, Biggio V, Fenaux P, Preudhomme C (March 2005). "CEBPA point mutations in hematological malignancies". Leukemia. 19 (3): 329–34. doi:10.1038/sj.leu.2403614. PMID 15674366.